Imagine you are the official portraitist of Marie Antoinette. Then, the French Revolution is getting more intense every day. What would you do? Elisabeth Vigée Le Brun was that painter and she had to make a big decision on whether to leave or stay in France. 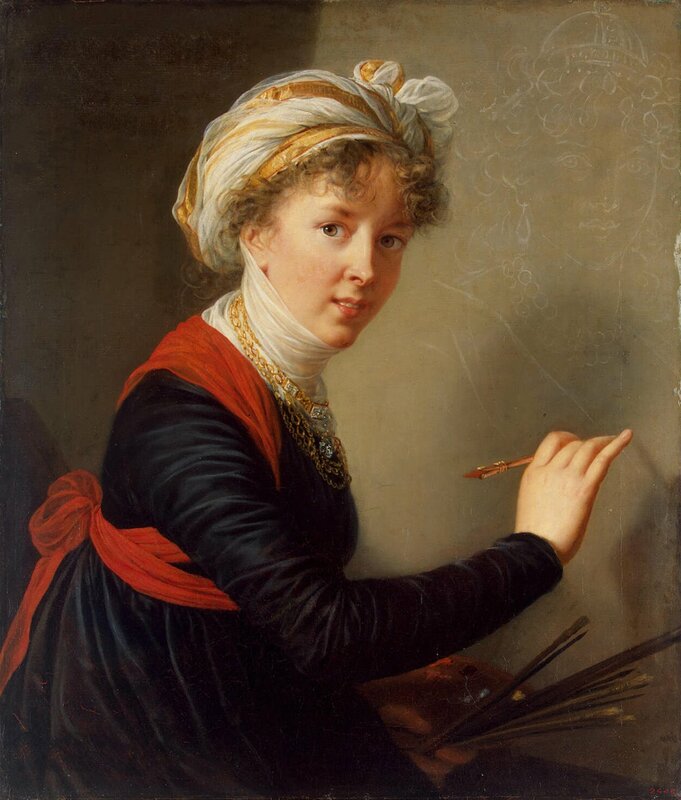 Elisabeth-Louise Vigée was born on April 16, 1755. She was the first born child of her father, Louis Vigée, an established artist and her mother, Jeanne Maissin, a hairdresser. She was baptized in the Church of Saint Eustache. Her brother Etienne was born three years later. Elisabeth’s mother obviously favored her brother Etienne but Elisabeth enjoyed special favor with her father. 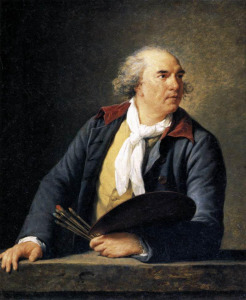 Louis Vigée was friends with some important artists of the time as well as some men of letters through his membership and as a professor of the Académie of St. Luc. Elisabeth spent her first six years with her wet nurse, a peasant woman in the village of Epernon, near Chartres. At six she went to the Convent of the Trinity for education until she was eleven. She would have learned reading, writing, counting, sewing, embroidery and rules of social behavior. While in school, she spent most of her free time drawing and she was beginning to show signs of talent. She would always insist throughout her life she was self-taught. Her father was to die on May 9, 1767 leaving Elisabeth depressed and unable to paint. 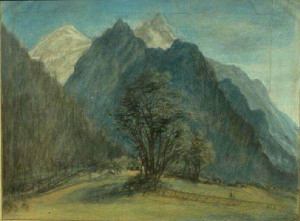 One of her father’s best friends urged her to paint and draw to overcome the death of her father. She would always find solace in her work for the rest of her life. She took some drawing and painting lessons, was encouraged by several of her father’s friends and started to turn into something of a beauty. Her work was also beginning to get some attention. Within a few months of her father’s death, her mother married again and they moved to a more fashionable area of Paris, giving Elisabeth more opportunity to meet influential people. While taking walks near the Palais-Royal she would meet noble ladies and charm them with her warm personality. Soon she was receiving visits and invitations to dinners and gatherings. Then the commissions would follow to paint portraits. She received an invitation to visit the chateau of Marly-Le-Roi where she had her first encounter with Marie Antoinette. In the fall of 1774, she applied for membership and was approved at the Académie of St. Luc. With her growing reputation, Elisabeth was earning quite a bit of money which was being taken by her stepfather. When he retired, he moved to a less fashionable neighborhood. One of the neighbors was an art dealer and painter name Jean-Baptiste-Pierre Le Brun. He was twenty-seven and she was twenty. He proposed marriage but Elisabeth hesitated at first. She was independent and self sufficient and enjoyed her life. Her mother believed Le Brun to be rich and urged her to marry. Elisabeth finally agreed, probably counting on the fact he was an art dealer to further her career. They were married at the Church of Saint Eustache on January 11, 1776. As so often happened, it turned out Le Brun wasn’t rich but he was a womanizer and gambler who took most of Elisabeth’s commissions for himself and spent them. Despite this, he was very loyal and worked all his life to further her career and to maintain her reputation. He dealt in Old Masters, his favorite being Peter Paul Rubens. Elisabeth’s favorites were Rubens and Anthony Van Dyck. The Le Bruns were to have a daughter named Julie on February 12, 1780. Maternal love was to be an overriding theme in her paintings. Elisabeth was to paint her first portrait of Marie Antoinette in 1778. She became the personal favorite and official portraitist of the Queen. Elisabeth would paint thirty portraits of the Queen over a period of ten years. She worked hard to give the Queen a sympathetic representation in her pictures, especially of being a mother. Elisabeth was to defend the Queen and the monarchy itself for the rest of her life due to this close, intimate relationship. 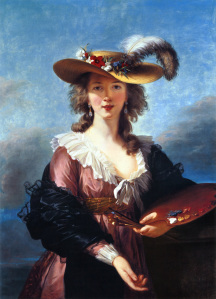 In 1783, Elisabeth painted “Self- Portrait with a Straw Hat”. This piece was instrumental in getting her elected to the Académie Royale de Peinture et de Sculpture in that same year. This honor was sought by all French artists, allowing many privileges among them the ability to exhibit in the Louvre’s biennial salon. Elisabeth also began holding salons of herself in her own home, inviting artists and writers. She was very successful in this endeavor. She would continue to do this until 1789. In 1789, the French Revolution was in full swing. Being a staunch Monarchist and personal friend of Queen Marie Antoinette put Le Brun in a precarious situation. She had to make a decision whether to stay in France at personal peril or to leave for safety. She decided to leave with her daughter in secret and quickly with only about eighty gold louis in cash, not a large sum. She escaped over the border into Italy. Like many artists of the time, she had dreamed of going to Rome. She went there, visiting many antiquities and artworks and painting commissions. In April 1790, she was elected to the Roman Accademia di San Luca. In the same month, she left to explore Naples, Venice and Milan. While in Naples she met, among others, James Hamilton and his mistress, Emma Hart. Hamilton was to marry Hart who later became the infamous mistress of Lord Nelson. Elisabeth painted Emma Hamilton several times. Elisabeth also ventured to climb Mount Vesuvius three times, while it was spewing ash. Elisabeth was deeply grieved to hear of the death of her friend and patroness, Marie Antoinette on October 16, 1793. In June of 1794, Elisabeth and Jean Le Brun were divorced. The separation had taken its toll on their relationship. Despite their distance, Le Brun worked hard to get the government to allow Elisabeth to come back to France. His efforts paid off eventually but not before Elisabeth travelled to Vienna, Saint Petersburg, Moscow, Estonia, and Berlin. She was commissioned to paint a portrait of Catherine the Great but the Empress died of a stroke a week later. While in Russian, Elisabeth was made an honorary free associate of the Imperial Academy of Arts of Saint Petersburg. While in Berlin, she was elected a member of the Berlin Academy of Painting. Elisabeth’s name was finally removed from the list of émigrés on June 5, 1800 but it took another year to receive all the proper documentation for her to return. On January 18, 1802, she finally arrived back in Paris with an ecstatic welcome by everyone. She returned to live in the home of her ex-husband and they remained friends until his death in August 1813. In April of 1803, Elisabeth left France to go to England and she remained there until July 1805. She was warmly received by the British. She met the Prince of Wales, (the future George IV), the painter Joshua Reynolds and her old friend Emma Hamilton. She held salons as she had in the pre-Revolution days in Paris. When Elisabeth received word her daughter Julie had returned to Paris, she reluctantly left England to return to France. Being a staunch Monarchist, Elisabeth was not esteemed by the Napoleonic Regime. She always wanted to visit the lakes and mountains of Switzerland and to make a pilgrimage to the home of Jean-Jacques Rousseau whose works she highly regarded. She spent the summers of 1807 and 1808 there. Her daughter was to die in December 1819. In 1820, at the age of sixty-five, Elisabeth took her last trip, visiting the Loire Valley and Renaissance chateau as well as Tours. She returned to Paris, bought a house and settled in to paint and write her memoirs. She requested in her will that she be buried in the cemetery of Louveciennes and wrote her own inscription. 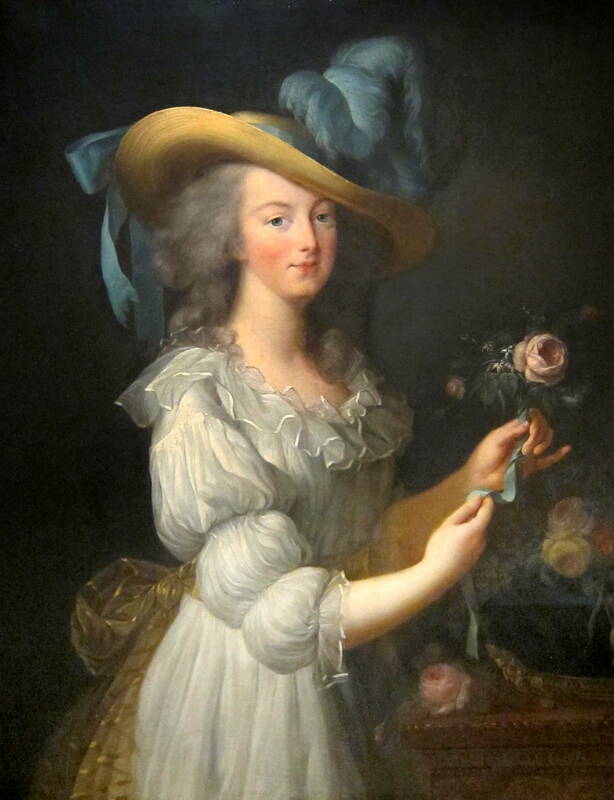 Here I rest at last: Louise Elisabeth Vigée Le Brun. Died 30 March, 1842. De profundis. Hi – An interesting & informative read. I’ll add a link to this page on my Touraine blog as soon as I have the time. One of the best French portrait painters to come out of that time. She had such an incredible influence on the public image of Marie Antoinette. Agreed, chickhistory! And what an adventurous woman she was too. She had a freedom a lot of women didn’t have at the time. What an interesting life! She was wise enough to get out of Paris before she literally lost her head. Great post! I’m glad to see that my favourite blog is now posting about art history. 🙂 It was really exceptional at the time for a female artist to succeed like she did – there were so many obstacles. 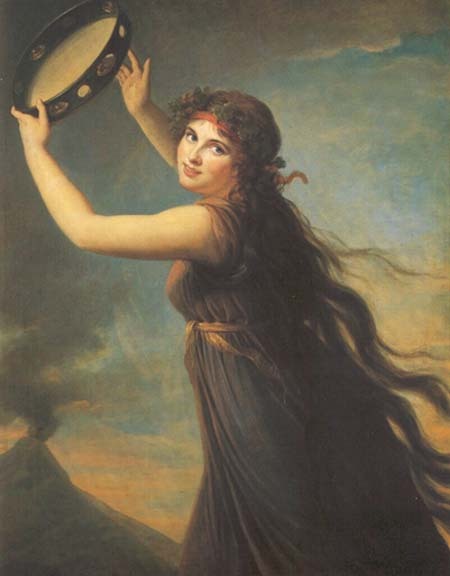 Another one was Angelica Kauffmann – maybe you could write about her too. Nora, Thank you so much! I was hoping you would like my humble post. Elisabeth was exceptional in many ways, wasn’t she? I have now ordered a book about Angelica Kauffmann so look for a post in the future! I wonder if Elizabeth hadn’t had her daughter to think of, would she have remained in Paris? Any woman who would climb Mt. Vesuvius while it was spewing ash certainly has a high tolerance for risk 🙂 She certainly was an interesting women. Good job! My feeling is she would have left Paris, with or with having a child. Her life really was in danger and they were guillotining people like her daily. Her adventurousness is what attracted me to her, as well as her artistic talent. Her brother Etienne was a chameleon and managed to adapt to all the political changes in France and survive. He was a poet and a playwright so he had artistic talent as well as Elisabeth. Thanks for reading! She was one adventurous woman. And she seems to have lived a full life.